Here are 20 videos on Youtube that take a look at various medieval philosophers and philosophical concepts from the the Middle Ages. Some come from more professional Youtubers such as The School of Life and Philosophy Tube, while others were created by scholars and students. Terry Jones, of Monty Python the Flying Circus fame, hosted a 2004 television documentary series entitled Medieval Lives. This episode looks at medieval thinkers and ideas. The Consolation of Philosophy is the name of one of the greatest and most useful books ever written, the work of the Roman statesman and philosopher Boethius, who wrote it in prison as a way to ward of despair and regret. The lessons of the book remain hugely applicable to our own times – and deserve to be known to all of us in the face uncertain times. From Philosophy Tube – What even is metaphysics? What do metaphysicians do? Lily King, Adjunct Professor at the University of South Florida, on Peter Abelard and the relationship between suffering and virtue in his ethics. CrashCourse on Anselm’s argument for God’s existence, while also considering objections to that argument. The School of Life on how Thomas Aquinas deserves to be remembered for reconciling faith with reason, thereby saving Western civilisation from turning its back on science and Greek and Roman wisdom. CrashCourse also offers this video on the philosophy of religion and the existence of god continues with Thomas Aquinas. Saint Augustine and Saint Thomas Aquinas are among the most famous Western Medieval philosophers but they had very different views on the world and the role of the State. The contrast between Saint Augustine’s pessimism and Saint Thomas’ optimism is striking. What can we learn from these men and their views today? Peter Adamson is Professor of Philosophy King’s College London and LMU Munich, whose primary areas of interest are late ancient philosophy and Arabic philosophy. In addition to his research he is the host of now more than 300 episodes of the highly popular “History of Philosophy” podcast. Talks at Google welcomed him to talk about the Philosophy in the Islamic World. The life and career of Ibn Sina (aka Avicenna) from the College of Wooster Libraries. In second episode of Dangerous Minds from Viral History, Joanne Paul explores the life, death & legacy of the Islamic philosopher Averroes (Ibn Rushd). A video from Al Arabiya English on Ibn Rushd’s influence. The remarkable life and legacy of Moses Maimonides (1135-1204). This video was produced for Lesson 3 of Great Debates in Jewish History, a course by the Rohr Jewish Learning Institute. The Medieval Reader on the 12th-century Jewish philosopher and poet Judah Halevi. The simplest explanation is usually the correct one? Or is it more complex than that? One of a set of videos posted by William & Mary Medieval Philosophy – perhaps as part of a class project. From The School of Life – The Renaissance is a historical period with some important lessons to teach us about how to improve the world today. We need to study it not for its own sake, but for the sake of our collective futures. Paul Sargent describes the intellectual movement of humanism and profile four major figures of the movement: Petrarch, Lorenzo Valla, Marsilio Ficino, and Pico della Mirandola. Nice guys too often finish last; they need to read the advice of one of the wisest and most realistic thinkers in the history of philosophy: Niccolo Machiavelli. What can medieval philosophy teach us today? Eleonore Stump, Professor of Philosophy at Saint Louis University, offers us some thoughts about the uses of medieval philosophy. 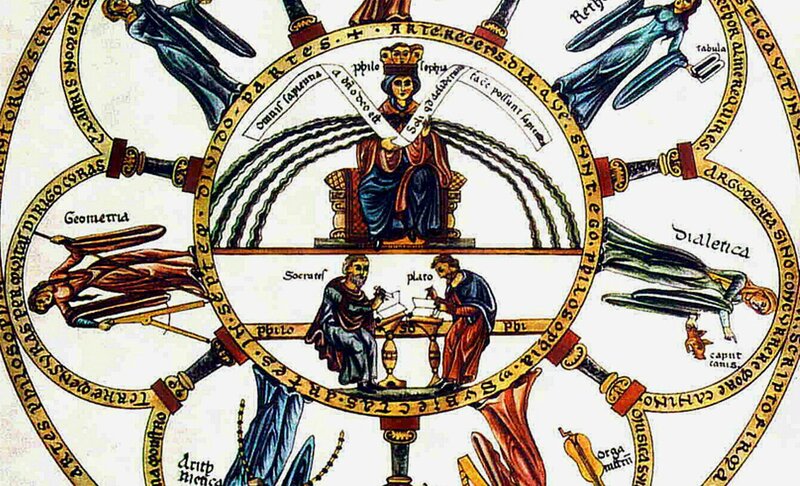 Top Image: Philosophy seated between the seven liberal arts; picture from the Hortus deliciarum of Herrad von Landsberg (12th century).